Wanting to receive $25k distribution from my fully vested 401k w/former employer. Figuring required 20% withdrawal penalty to be $5k (25,000 x20%), so my account balance would be reduced by a total of $30k. However, they are telling me it will be a $31,250 deduction (25,000 / .80). Is this right? Im paying tax on the tax penalty? Plus then I'll owe the IRS another 10% penalty at time of filing on which figure, $25k or $31,250? I'm paying tax on the tax penalty? No, you're paying tax on the amount withdrawn to cover the tax. If you withdraw $31,250, you'll pay a tax of $31,250 * 20% = $6,250, netting $25,000. This process is typically called "grossing up". You could withdraw $30,000 and pay the other $1,000 of the $6,000 tax (plus the $3,000 penalty) out of pocket. Plus then I'll owe the IRS another 10% penalty at time of filing on which figure, $25k or $31,250? You'll owe a 10% penalty on whatever is withdrawn, so if you can't cover any tax out of pocket, you'll have to withdraw a total of 25,000 / (1 - 0.2 - 0.1) = 35,714. 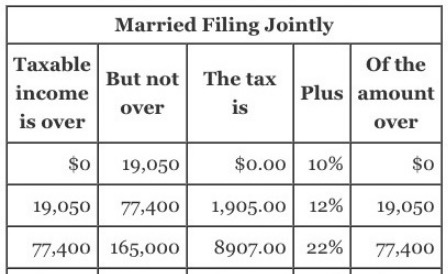 You'll pay a 20% tax of 7,143 and a 10% penalty of 3,571 for total tax/penalty of 10,714, netting you $25,000. So you're effectively paying 43% in tax and penalty. Still want to make that distribution? If this acct has a balance you are not disclosing, and you requested $25K in a way that specified 'net', then yes, a $31,250 distribution with $7500 withholding, will net you $25,000. You then still owe $3,125 penalty if under 59-1/2, and still reconcile taxes at year end. Is the need to withdraw urgent? Best to avoid it, if not. In response to Ben's comment to D Stanley's answer, I'd like to add an important point/clarification. A retired couple (with zero other income/no social security payments, etc, but over 55, so no penalty on 401(k) withdrawal), withdraws $100K. $20K is withheld. $76K is taxable after standard deduction. Tax due is $8739. The mandatory 20% withholding is far more than would be needed to cover the tax for most taxpayers. Note: The top 10% of all earners is $120K or so. For the OP of this question it implies he needs to do the math to understand the actual tax due vs the 20% withheld. For others, it means a strategy of regularly transferring funds from one's 401(k) to an IRA to be able to fine tune the percent withheld. Not the answer you're looking for? Browse other questions tagged united-states taxes 401k withdrawal penalty or ask your own question. How Does The IRS Structure Payment Plans If I Owe Subjectively High Taxes?